No matter what town you traveled to in the Old West, you could at least be sure to find two things: a sheriff, and a saloon. Sometimes, you'd probably find the sheriff in the saloon, but if there weren't any lawmen keeping an eye on things, it was up to the saloonkeeper to make sure people stayed out of trouble. 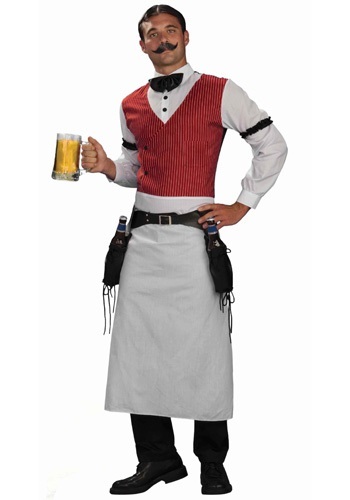 Show off your old timey bar tending and peacekeeping skills in this dapper Saloon Bartender Costume! You never knew what to expect when you stepped into a new saloon. There might be a group of surly old timers drinking and playing cards all day and night, or some folks dancing to the tune of an automatic piano. There's a decent chance you could even immediately walk into a fight, if the town is rowdy enough. But you could always be certain there would be a well-dressed gentleman behind the bar, pouring stiff whiskey and chatting up his patrons in friendly conversations. But, if someone caused trouble, threatened him or his patrons, or decided not to pay their bar tab, he might just grab that scattergun he's got hidden under the bar and remind them of who's in charge in his saloon! Of course, it's better when everyone has a drink and gets along, which you'll be perfectly dressed for in this classy costume. 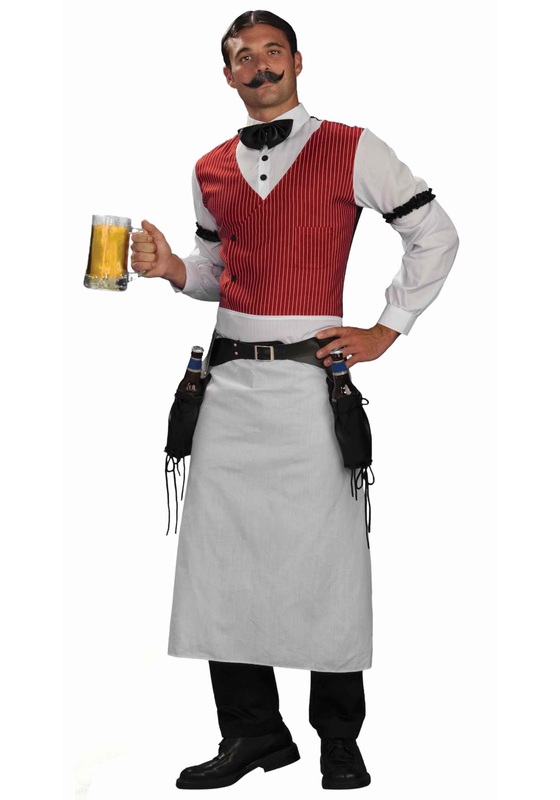 The vest, bow tie, and sleeve garters look like they were taken right out of the Old West, to give you a smart look while you mix drinks and mingle. Be sure to put some pomade in your hair, and keep an eye out for shifty characters, especially those who look familiar from any “Wanted” posters. I have an open mind to the kind of material it would be made of. It is thin HOWEVER..it's a great costume! One little tidbit: wish the shirt/vest was made just a bit longer. My BF has a long torso(5'10"-30"pant inseam,185lbs) the shirt tail ends approx 2" from his pant waist. (Which sits pretty low. I guess he can tuck the back and the front will be covered by the apron. I purchased an XL. I purchased the Saloon Madame costume..will write a review once I try on!